Fluid mechanics, the study of how fluids behave and interact under various forces and in various applied situations—whether in the liquid or gaseous state or both—is introduced and comprehensively covered in this widely adopted text. Revised and updated by Dr. David Dowling, Fluid Mechanics, 5e is suitable for both a first or second course in fluid mechanics at the graduate or advanced undergraduate level. Along with more than 100 new figures, the text has been reorganized and consolidated to provide a better flow and more cohesion of topics. 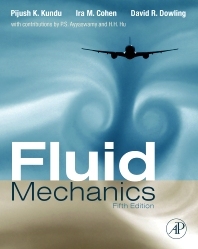 Changes made to the book's pedagogy in the first several chapters accommodate the needs of students who have completed minimal prior study of fluid mechanics. While in college, David R. Dowling held summer positions at Hughes Aircraft Co. and the Los Angeles Air Force Station. He completed his doctorate in 1988 at Graduate Aeronautical Laboratories of the California Institute of Technology and moved north to Seattle to accomodate his wife's career in medicine. While there, he worked for a year in the laser technology group at Boeing Aerospace, and then for almost three years as a post-doc at the Applied Physics Laboratory of the University of Washington. In 1992, he accepted a faculty position at the University of Michigan. Prof. Dowling is currently conducting research in acoustics and fluid mechanics. He is a fellow of the Acoustical Society of America, a member of the American Society of Mechanical Engineers, and a member of the American Physical Society. He is a US citizen. Excellent service, received within a business week. Will buy from Elsevier again without hesitation. This is by far and away the best comprehensive graduate level fluid mechanics text available.